Extreme fires exhibit a level of fire behaviour beyond that predicted by existing fire behaviour models. They may be fast moving, have very large flames, high fire intensities, and have other characteristics such as spotting and fire whirls. They are highly dangerous and cannot be suppressed using current fire management strategies. Vision: to prepare New Zealand for extreme fire. The Extreme Fire Research Programme aims to improve existing understanding of fire behaviour and develop greatly improved, targeted protection against extreme fire. This is a five year (2016-2021) $8.75M programme, involving an international research team and led by Scion’s renowned fire research scientists. This research will challenge existing understanding of the role of convective heat transfer in fire behaviour, and develop targeted strategies for protecting key assets against extreme fire. 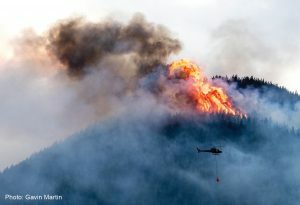 Ultimately the research may change global wildland fire science and drive innovation in fire-fighting decision support, training, mitigation tactics and community readiness. Creating a new fire spread model – testing new theory around heat transfer at the fire front by turbulent convection processes (rather than radiative processes), using highly instrumented experimental burns in a range of vegetation fuel types. Developing innovative decision support tools – automating and linking systems for satellite and ground-based fire detection (SmartFire), fire growth prediction (Prometheus) and smoke modelling (BlueSky Framework), to provide real-time predictions to improve current and future fire response. Investigating new extreme fire prevention methods – developing new response technologies to prevent and suppress extreme fires, potentially including smart thermal sensor networks, enhanced fire fighting tools and equipment. Targeting protection and preparing communities for extreme fire – developing strategies and methods for protection of important ecosystems, assets (e.g. forestry) and communities from extreme fire. 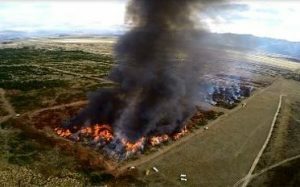 Use of fire as a land management tool – developing and presenting a ‘Prescribed Burn’ training course, and analysis and ‘mythbusting’ of findings from a survey on use of fire as a tool in rural New Zealand. This project builds on the past 20+ years of rural fire research in New Zealand including the recent MBIE ‘Rural Fire’ and ‘Emerging Fire Risks’ programmes. Research programme governance and support is provided by the Rural Fire Research Advisory Committee, which comprises representatives from Fire & Emergency New Zealand, Forest Growers Levy Trust, Department of Conservation, NZ Defence Force, Local Government NZ and Federated Farmers of NZ Inc.
A wilding burn photographed by UAV. Extreme fire near Hanmer, North Canterbury, 2017. 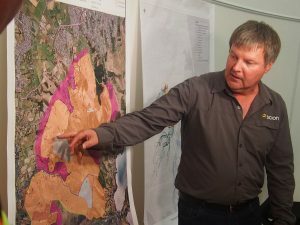 Grant Pearce describes the extent of the Port Hills fire, Christchurch, 2017.